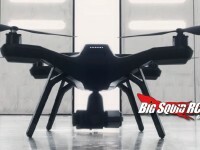 3dr « Big Squid RC – RC Car and Truck News, Reviews, Videos, and More! You are browsing the "3dr" tag archive. It must be Aerial April, because the team over at 3DRobotics just modified their homepage with the date April 13, 2015 and a video teasing some baboons flying a new quadcopter. A few screenshots are below, but this is a definite upgrade from their current IRIS+ quadcopter. This month just keeps getting better and better! For all 3DRobotics news, trust BigSquidRC! See previous news Right Here.